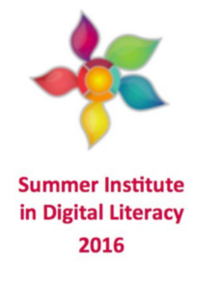 For the last five days, I’ve spent my time with some amazing people who are both running and learning from the Summer 2016 Institute on Digital Literacy at Rhode Island University in Providence, R.I. Everyone has partnered up this week to produce a digitally-enhanced project to take back for use in our various professional areas. The following is our work in progress project concerning evaluation of online sources in the chaos of the digital landscape, focusing on political sources due to the upcoming presidential election. We foresee this project spanning several class periods in an Introduction to Mass Communication college course. Step 1. Introduce the topic with a hoax video. This is a video Professor Wilderman fell for (embarrassing!) Discuss why people fall for hoax information. Watch video! Step 2. Most of us know where our political alignments fall, but we often don’t fully understand other views outside our own. 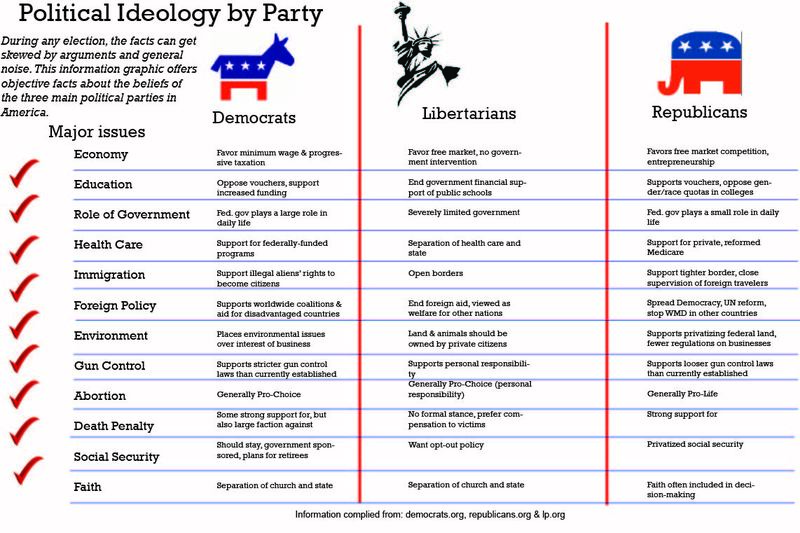 Before we read some political articles, refresh yourself on the general political ideology of the three major parties using the following information graphic. 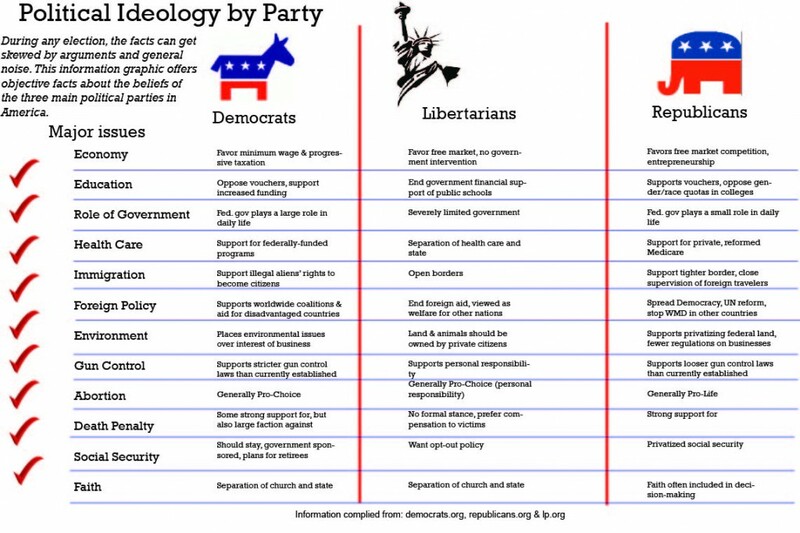 1) A group of three students will read articles about the Democrat, Republican, or Libertarian perspectives on a single issue. Students will summarize their perspective and explain that perspective to the group in a discussion either online or in person. Students will answer the following questions individually before they meet with the group and then share their answers with their classmates. A) What are the arguments for the political perspective you read about? B) What evidence is available in the articles to support the political perspective you read about? C) What are the opinions in the articles about your issue? D) According to the Politifact article, was the candidate’s statement true, false, mostly true, mostly false? What evidence was used to support this conclusion? Do you accept this evidence? Why or Why not? 2) After the discussion, students will reflect on the discussion individually. A) After listening to other perspectives on the issue, which do you most agree with and why? What evidence informs your opinion? B) After reading the political party information graphic from step 3, which party do you most identify with? Are there issues you agree with or think you agree with more in the other party platforms? If so, which ones and why? Step 4. We will start this class session with students reading three more articles/pieces of media selected by the professor. The selected items will cover the same piece of information, for example Hillary Clinton’s announcement of Tim Kaine as her vice presidential running mate, but from three very difference sources. After students read those articles, proceed to step five. Step 5. Use the Evaluation of Online Source quiz on each of three sources your professor gives you. A score of 18-20 indicates a very credible source, 15-17 indicates moderate credibility, 12-14 indicates below average credibility, and 11 and below indicates a non credible source. After all students have evaluated all three sources, discuss their outcomes. Which source was most credible, least credible?